We recommend you install the Stainmaster® Carpet Cushion with Odor Guard under any type of carpet. This carpet padding for sale will keep your carpet looking new longer. It will make it easier for you to clean and maintain, and it eliminates any concerns about odor caused by pet accidents as well as most food and beverage spills. Stainmaster® is guaranteed to lengthen the life of all carpets by absorbing pounding foot traffic, reducing wear and tear as well as, improving the overall comfort level of your carpet. This carpet padding for sale also protects the floor from moisture making spills easier to clean up. ODOR GUARD is an enzyme technology that eliminates odors caused by pet accidents and most food and beverage spills. ODOR GUARD self activates to consume and eliminate any organic substances before they can cause permanent odors. STAINMASTER® carpet and STAINMASTER™ carpet cushion form an unbeatable system to keep your carpet fresh, clean and beautiful for years. When spills do happen, STAINMASTER® carpet repels spills and STAINMASTER™ carpet cushion keeps them on top of the cushion so they can be removed completely by extraction cleaning, preventing them from reappearing. If you install STAINMASTER™ carpet cushion with your STAINMASTER® carpet we’ll extend your STAINMASTER® carpet warranty. By enhancing STAINMASTER® carpet warranties and incorporating advanced technologies, STAINMASTER™ carpet padding for sale is perfect for maintaining beauty that lasts..
Stainmaster® Plus® carpet cushion features an exclusive moisture barrier and ODOR GUARD Technology. 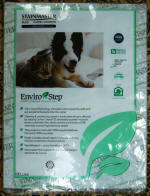 This carpet padding for sale includes ODOR GUARD technology. It works naturally on common stains by activating the system's powerful enzymatic cleaning action.. If a spill penetrates the carpet backing, the technology will continuously and permanently eliminate even the most offensive odors. Carpet Odor and Spot Remover, featuring ODOR GUARD technology, is the perfect companion to your STAINMASTER PLUS® carpet cushion. It treats spills that do not penetrate the carpet backing. It is safe and effective, but is not recommended for carpets made of cotton or with anti-microbial treatment. Price CALL FOR PPICE - 32 fl. oz. This carpet padding for sale carries Carpenter's "Fully Transferable Life of the Home" Warranty. We warrant that our carpet cushion will offer luxurious comfort and outstanding support for as long as you own and reside in your home. If it fails to do this, we (Carpenter) will replace it free of charge, including labor charges. Your satisfaction with the ODOR GUARD Technology is guaranteed. STAINMASTER PLUS® carpet cushion is produced with special odor-fighting enzymes that eliminate organic odors. Carpet Odor and Spot Remover removes both odors and stains from carpet and cushion - including difficult organic odors and many common household stains like pet accidents, blood, baby formula, dirt and grass. This system is not effective on airborne odors or non-organic spills such as paint, nail polish, etc. Tape the seams - Use Duck Tape or any tape that has a moisture barrier. Do not staple - Stapling pad will void the warranty.